In order to better protect the residents within the City of Jonesboro, the city owns and operates Outdoor Warning Sirens. The City of Jonesboro’s outdoor warning siren system consists of four (4) sirens placed strategically throughout the city as a warning device to alert citizens outdoors of imminent severe weather. The City of Jonesboro's Outdoor Severe Weather Warning Sirens are activated automatically when the National Weather Service issues alerts for severe weather in the Jonesboro area. 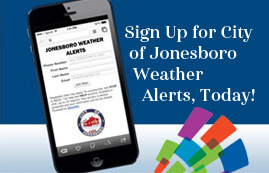 In order to receive email and/or text messages for weather alerts issued by the National Weather Service for the Jonesboro, Clayton County area; please read, sign and return the following release form to Jonesboro City Hall. We may add or remove email notifications at any time. Site # 3: Clayton Co. Schools Maintenance Building. 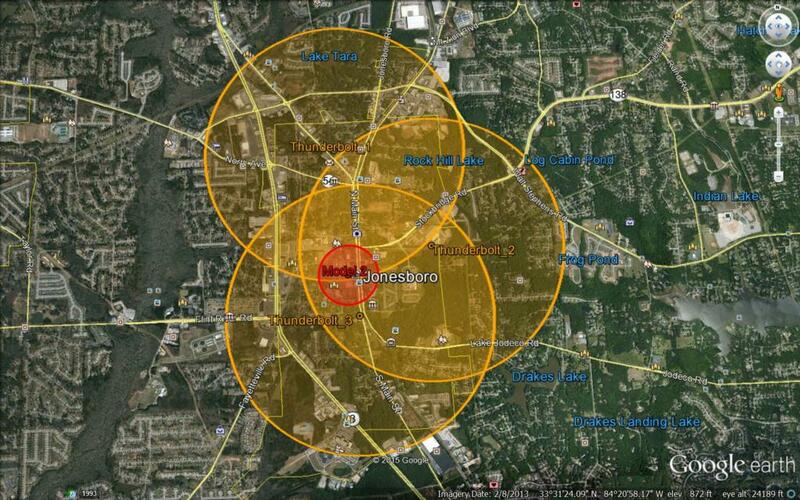 When residents hear the sirens, they are urged to seek shelter and turn on a radio or TV for emergency information. When the sirens are sounding for severe weather, the radio or TV announcements will provide you with information regarding the type of storm and appropriate safety actions. Developed as an early warning system of severe weather to persons outdoors, the system should not be relied upon for early warning to individuals indoors. Air-conditioning, thunder, wind, rain and other conditions can cause the sirens not to be heard indoors. Sirens are also subject to equipment malfunction as well as failure due to damage from lightning strikes. If you are outdoors and hear a siren, you should seek shelter immediately as the threat may be in your immediate area. Tornado Alert Signal – This siren will wail a tone for a total of three (3) minutes. This siren indicates that trained observers or radar has sighted a tornado. You should seek shelter immediately and tune in to local radio, television or your NOAA weather radio for instructions and information. Test Alert Signal – This siren will wail a steady tone for 20 seconds and stop. The Emergency Warning System sirens will be tested the first Wednesday of every month at 12:00 p.m., weather permitting. The Emergency Warning System sirens will be tested the first Wednesday of every month at 12:00 p.m., weather permitting.